We are offering FREE ferry crossings on all self-catering holiday cottages booked with bookings starting after the 31st October 2018 and completed before the end of March 2019 (excluding the Christmas and New Year period). A cosy winter self catering holiday property break awaits you, whether you are looking to come over for a short break or a little longer, we will organise your ferry travel at no additional cost. 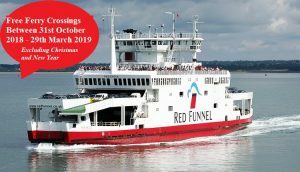 Red Funnel ferries provide great onboard facilities on their fleet of cross Solent vessels and offer an extensive timetable of sailings to suit your plans. We can also offer discounted rates for all other times of the year that this offer does not cover.